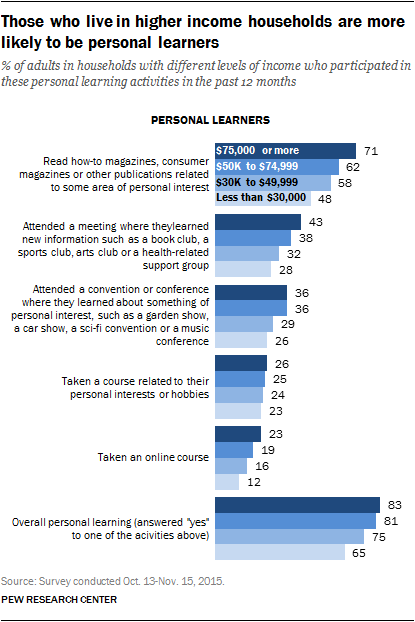 The survey’s overall findings show that adult learning – for personal or professional purposes – touches a wide range of Americans. However, significant differences emerge along adults’ levels of educational attainment and income. Those on the lower end of those scales are less likely to engage in professional or personal learning and have less positive views of their impacts. Additionally, the internet plays less of a role in how they go about learning than it does for those with higher levels of income and education. The sizes of the key segments being compared are worth underscoring. Some 40% of adults have high school degrees or less in the United States, while 28% have college degrees or more. One-third (32%) of adults report living in households with annual incomes of $30,000 or less, compared with 27% who say they live in homes where their annual incomes exceed $75,000. The nearby charts show how the results break out for all responses for personal learning focusing on those on the lower end of educational and income spectrums; that is, comparing those with high school degrees or less to those with college degrees and those in households whose incomes are below $30,000 annually to those in households with annual incomes above $75,000. The patterns are roughly the same for personal learners, with findings at either end of the income spectrum congruent with those at either end of the education spectrum. The differences are acute for overall incidence of professional learning as well as the most prevalent example of professional learning – maintaining or improving job skills. Educational differences demonstrate this most vividly. Among employed adults with college degrees, 72% have engaged in professional learning in the past year, while 49% of those with no more than high school degrees have done this. Looking at the economic factors for professional learning reveals similar, if somewhat less pronounced patterns.